One could say that I’m jumping the gun on this post. But I’ll argue that I’m giving design-lovers six months fair warning, and I can’t contain my excitement: The United States Postal Service has announced their 2011 special stamps. 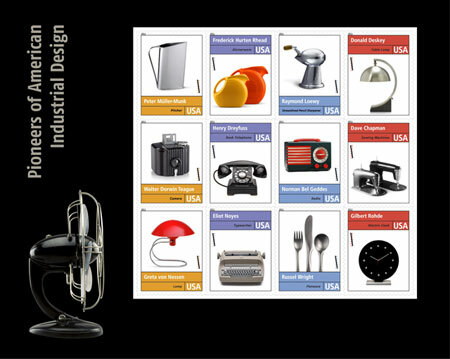 In July we’ll see a sheet celebrating the “Pioneers of American Industrial Design”! The stamp series honors twelve of the nation’s most important and influential industrial designers. Their combined work encompasses everything from furniture and appliances to office buildings and locomotives, and it shaped the look of everyday life in the 20th century. This new pane of stamps will be “Forever” rate, so I’ll be stocking up to use these for years of rent checks and utility bills. The stamps are beautifully designed–and they beautifully connect to many design objects in the Milwaukee Art Museum’s collection. 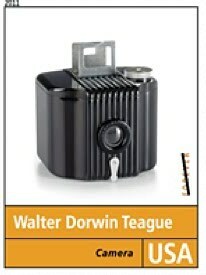 Designer Walter Dorwin Teague, often heralded as a “dean” of industrial design, is celebrated with his 1934 “Baby Brownie” Camera for the Eastman Kodak Company. You’ll see utensils and a bowl that he designed with Steuben Glass Works on view in the Museum’s 20th century Design gallery. The glass-handled fork and spoon are gorgeous in their simplicty and clarity, and always make me question why more of our flatware doesn’t have glass handles. As a special loan from a Milwaukee area collector, Teague’s much-celebrated glass-fronted “Blue Bird” Radio blue radio made for the Spartan Corporation is also on view. The Museum’s gallery includes the “Manhattan” Cocktail Set (ca. 1936–38) designed by Norman Bel Geddes, celebrated on the USPS stamp above with his red, white, and blue “Patriot” Radio of 1939. 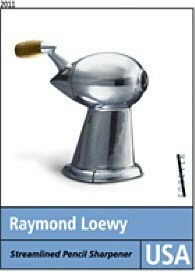 Designer Raymond Loewy designed the pencil sharpener (1933) above to express forward motion. With the “streamlined” shape of a falling drop of water, this aesthetic was shared both by fast-moving luxury ocean liners and stationary objects like the sharpener. Loewy also but also lent his fashionably modern eye to Rosenthal Porcelain’s “Charcoal” Coffeepot on view in the Museum’s gallery. Designer Donald Deskey is best known for the lavish Art Deco interiors he designed in New York City in the 1930s. 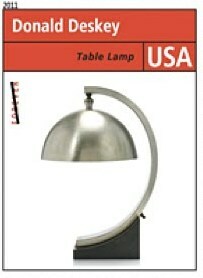 The USPS stamp shows a swooping chrome table lamp. At the Museum, you can see an equally “swooping” blue vinyl armchair that captures the optimistic forward motion aesthetic of Art Deco. Russel Wright is represented in our 20th-century design gallery by a chartreuse gravy dish and tray from of his most well-known design, the “American Modern” dinnerware. The immensely popular tableware design, with its soft edges and muted color palette, brought modern design to the mass American market and is still highly collected today. 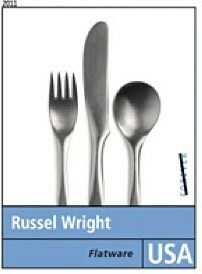 The USPS stamp shows another of Wright’s minimal, informal forms that reflected a new American middle-class lifestyle–his “Pinch” line of flatware from 1950. The Museum’s gallery shows a 1935 aluminum and enameled steel blue Thermos designed by Henry Dreyfuss. Though attractive and tying perfectly to the Art Deco style of that decade, this one object can’t possibly exemplify a designer’s career that lasted more than forty years and included products ranging from tractors to clocks. Dreyfuss made important advances in the application of ergonomics to product design–that is, fitting the object’s design to the human body. 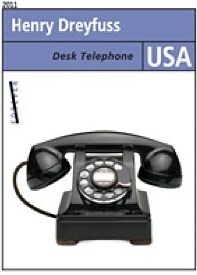 Dreyfuss’s stamp shows his Model 302 desk telephone, introduced by Bell Telephone in 1932 and used into the 1950s. 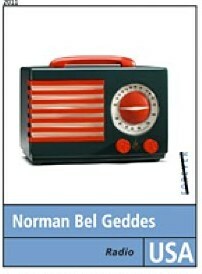 It was one of the earliest phones to integrate the bell and circuitry into the phone body. The stamps are available in July, and the Milwaukee Art Museum’s 20th century Design gallery is found on the Main level of the Museum. This entry was posted in Art, Art News and tagged American Art, Decorative Arts, Design, Donald Deskey, Henry Dreyfuss, Norman Bel Geddes, Raymond Loewy, Russel Wright, Walter Dorwin Teague. Bookmark the permalink.